Myraeth's ecclectic mix of diverse styles defies traditional classification. At some point of the day, when all work is done and you see you still have some time to relax before dinner, you feel like listening to some good Doom in order to drift away, daydream a bit… I was in this state of mind the last time I picked up this album by Myraeth to put an end to this long-due review and, because I can let pass a good deal of time between two listening sessions, I wasn't expecting what I was in for: an aggressive assault of blood-thirsty notes jumping at me, attempting to tear my guts into pieces. It'll teach me to do my homework more seriously. This Australian band is still quite young; 'In Glorious Death' is their first full-length coming after an Ep released in 2010. I've been told the Australian scene is as small as the country is vast, which is why I thought that some of the members of Myraeth might be involved in other local projects ("local" being a ridiculous term when considering Australia. I mean: Australia! A continent in itself, but, as it seems, there is not that much of a real, cohesive Metal scene over there). To my surprise, I couldn't find any of them being credited anywhere else. It comes as a real surprise indeed as everything here is just so well balanced, so carefully crafted, and expertly delivered. I know that at this point of a review, everybody wants to know what we're talking about, what style the band fits in… Well, sorry to disappoint, but labelling Myraeth's music is not an easy task. Many Death Doom bands (here’s a hint for you!) make you draw comparisons to other maybe more famous acts belonging to same genre. 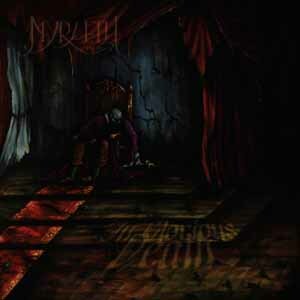 Myraeth on the other hand, although a Doom band, could be compared to bands outside the Doom spectrum: the eccentric songs of Dark Metal bands like Soulfallen, Thurisaz and Moonspell come to mind, full of twists and daring moves, and the listener is even reminded of the punch of Melo Death outfits like Souldrainer and Opeth. I've had a hard time deciding on which side of the Doom border Myraeth stand. Frankly, I'd say both. Their dreadful, somber atmospherics, the heavy use of tragic violin coupled with ethereal female vocals and deep male growls, the mid to slow tempo and soaring leads easily earn them a ticket to the Doom realm. On the other hand, you can't skip those other parts, tightly intertwined with the first ones, where they play fast, combining blasted passages with bouncy grooves; you can't forget the hectic keyboard lines nor those moments when the violin reaches its highest notes, swirling with fury. Ultimately, this kaleidoscope of sounds, atmospheres and styles makes the band a bit derivative. You could say they have prioritised their thirst for eccentricity over their identity: it is audible that they try very hard to be original and surprising, and surely, a huge amount of work has been put into this album, both music- and production-wise. But at the end, I still didn't remember what to expect from it. However, it does have a replay-value. It lies in the complexity of this band full of contrasts. The tracks and each progression within them are certainly not as memorable as one might desire, but they all hold their share of great moments. It’s not that anything does shine individually, but some swinging rhythms, some tragic violin chords, the many instances of gathered momentum followed by sudden drops of tension, the post-production effect on some of the vocal parts, the piano, played in an almost cheerful way, releasing bright and full notes in the heart of a tempest of Heavy Metal riffs, the narrative scope of the whole which bears a true, convincing evocative power and, as I said in the beginning, the top-notch musicianship that supports the outstanding songwriting abilities make this album immediately enjoyable, from start to finish. So, at the end of the day, Myraeth obviously don't give a damn whether they should be labelled Death Doom, Doom, Melo Death or Dark Metal. And if they don't, neither do I. Listening to the CD gave me great pleasure. The various soundscapes resulting from the large array of emotions on display make for an exciting journey… A journey you'll probably forget about – but that's all for the better: each new listen will be as fresh as the first one.